She has been deftly undressed by an orangutan in Borneo, hunted by a tiger in India, and swum with piranhas, electric eels and dolphins in the Amazon. She has searched the Altai Mountains of Mongolia’s Gobi for snow leopards and hiked into the trackless cloud forest of Papua New Guinea to radiocollar tree kangaroos. Sy’s 18 books for both adults and children have garnered many honors. THE GOOD, GOOD PIG, her memoir of life with her pig, Christopher Hogwood, is an international bestseller. She is the winner of the 2009 New England Independent Booksellers Association Nonfiction Award, the 2010 Children’s Book Guild Nonfiction Award, and the Henry Bergh Award for Nonfiction (given by the ASPCA for Humane Education). Her book KAKAPO RESCUE won the Sibert Award, and her biography TEMPLE GRANDIN won the American Association for the Advancement of Science’s Science Film and Book Award. Her work with the man-eating tigers, the subject of her book SPELL OF THE TIGER, was made into in a National Geographic television documentary she scripted and narrated. Also for National Geographic TV she developed and scripted MOTHER BEAR MAN about her friend, Ben Kilham, who raises and releases orphaned bear cubs, which won a Chris award. She is a 1979 graduate of Syracuse University, a triple major with dual degrees in Magazine Journalism from the S.I. Newhouse School of Public Communications and in French Language and Literature and in Psychology from the College of Arts and Sciences. She was awarded an Honorary Doctorate of Humane Letters from Keene State College in 2004, and an Honorary Doctorate of Humane Letters from Franklin Pierce University and also from Southern New Hampshire University in 2011. 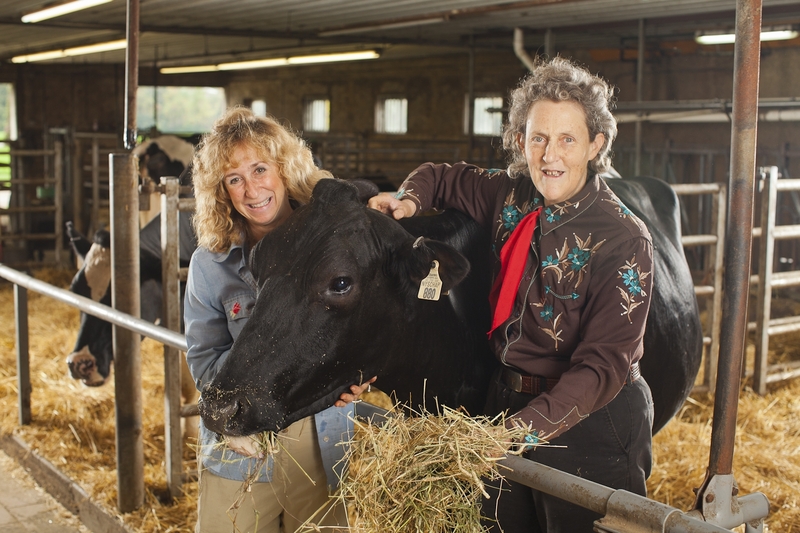 Gigi Amateau: How did your back ground as a science/nature writer prepare you to write Temple Grandin’s biography? Sy Montgomery: My experience as a science writer helped me to understand autism. My experience as a nature writer prepared me to appreciate the gifts of a different mind. All my writing goes back to animals. I owe them everything. One reason animals are endlessly fascinating to me is the way they think. When birds think, they probably think in images, and those images are in colors and detail we can’t imagine. Animals like dogs, wolves and bears probably often think in scent, as they experience the world’s smells in a far richer way than we do. I can’t ask a bear or a sparrow what their thoughts are like–but I can ask Temple. And she thinks in pictures–a different way than most people do. I have been drawn to her brain and her work for decades for another reason as well: humane treatment of animals is one of my moral priorities. Science has shown us that animals think and feel. My work as a nature writer has convinced me beyond a doubt of what most children already intuitively understand: animals love their lives as much as we love ours. I’ve been a vegetarian for 30 years because I’ve been appalled at the way most of the animals raised for food are treated on factory farms. Temple has been working hard to change that. GA: Throughout the book, it often feels as if Temple is speaking directly to children from her own experiences. When writing a biography for young readers, what are you looking for to make the story appealing? GA: You’re known for your commitment to up-close and personal research! How did your research process change while you were working on this book? Does research for a biography differ from writing about the natural world? SM: Researching this book did not involve swimming with piranhas, picking leeches out of my socks and underwear, or hiking till my feet swelled so I couldn’t get my boots off! I had to do no physical conditioning for this book, nor did I have to learn a foreign language, nor a new skill like SCUBA. But I had just as much fun with this book as I have had working on books about pink dolphins, tigers, tapirs, tree kangaroos and cheetahs. It was just a different kind of immersion. I hope you can feel in the book the tremendous affection as well as admiration I feel for Temple as I came to know her, and that’s what made working on the book so much fun. I made a wonderful new friend–Temple is one of my favorite people EVER! Whenever we get together, we always have a blast, and laugh our heads off. GA: What was the most surprising the thing you learned while writing this book? SM: We always hear “children can be so cruel” and this is true–but they can also be wonderfully compassionate and accepting. I learned that Temple actually had a really fun childhood thanks not only to her mom and her teachers, but also because of her many friends and classmates at her elementary school. They accepted her as she was, and always wanted to be in on her fun projects. They looked out for her. When other kids who didn’t know Temple sometimes teased her, they stuck up for her. Temple had troubles in junior high, but when she went away to boarding school in New Hampshire, she made close friends with some very special young people–folks who she’s now back in touch with. They are so proud of her today! SM: I’m looking forward to publication of two new books: THE TAPIR SCIENTIST comes out this summer, and it’ll be the first book in the Scientists in the Field series for young people to feature a Latin American, Pati Medici, as the lead scientist. Next year CHASING CHEETAHS comes out, starring another strong and fearless woman, Laurie Marker. As I write this, I am preparing for a trip to Moorea off Tahiti where I’ll be skin and SCUBA diving with octopus experts as research for two new books, one for adults, one for kids. These books will be my first venture into the marine world, and I am hoping there will be many others. The book after that one will be about great white sharks!